You’d be surprised at the variety and value you’ll find at Dollar Tree or a similar discount store, especially when it comes to wedding decoration items. Bring a crafty friend and look around the aisles with creative eyes; you’ll find all sorts of idea starters. For example, think of using small stemless wine glasses — each for $1, of course. 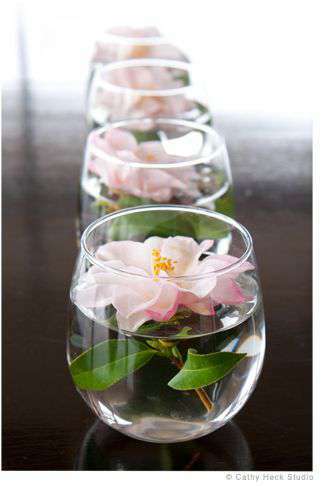 Turn these glasses into an attractive tabletop decoration by partially filling them with water and floating an artificial flower (also found at Dollar Tree) on top. If you want to dress things up, you can add several plastic pearls to float alongside the flowers. Simple and elegant. If dramatic impact is what you’re looking for, purchase $1 stemmed wine glasses in 3 different heights, and paint the stems black. Turn the glasses upside down and place an artificial flower underneath — we love the red roses pictured here. 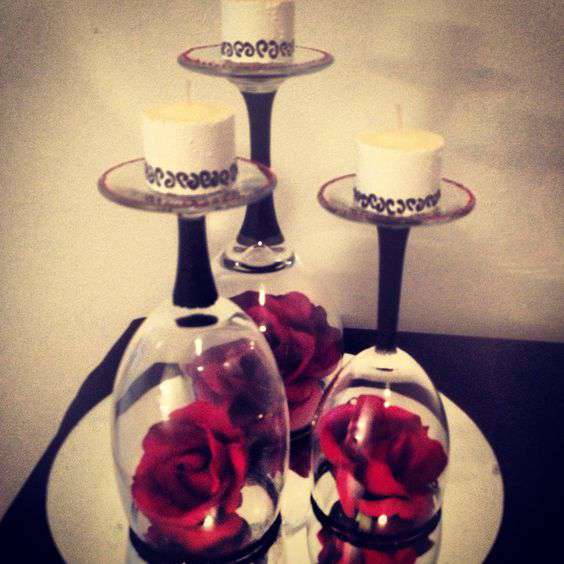 Lastly, purchase votive candles or tea lights and place on top of the wine glass base. Voila! — another simple and easy idea to dress up your table tops and bring romance to the reception. Want to notch up the glam for your centerpieces? Glitter is all you need. Medium-sized glass candle holders like the ones shown in this picture are an easy find at the dollar store. Neatly tape off a line halfway down the holder, evenly apply glue or a spray adhesive and then roll in glitter. 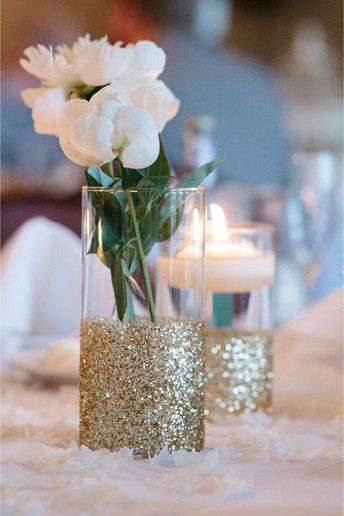 This sparkly holder can be used as a dressed-up vase for a single stem flower or, filled with water and a floating candle it becomes a glittery, sleek candle holder. Either centerpiece will make your reception tables shine. Besides, what princess doesn’t want some glitter on her big day? There are so many unique and thrifty ways to create wedding table top decor that shines with your own style, yet doesn’t make a big dent in your wedding budget. All it takes is a little inspiration and a trip down the aisles of your local dollar store!